If you’re looking for something a little different to occupy your gaming time for the next few hours then Pinball Roulette from Ash Gaming might be right up your street. Pinball and Roulette may not be the most obvious of games to bring together but read on and check out our review below to make up your own mind. This is where the game starts and it’s here you can see a normal roulette table (above) and it’s also here where you should place your bets. Roulette aficionados will be pleased that there’s the European-style single green zero rather than the double zero favoured in the US. Place your bets how you wish and click bet and the next screen with the pinball machine pops up. 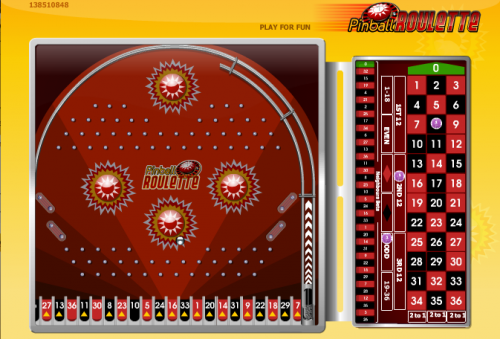 Rather than a spinning roulette wheel you are now presented with a pinball machine; the ball is set off automatically and after making its way through the pins and bumpers will come to rest in the moving row of numbers at the bottom of the screen. 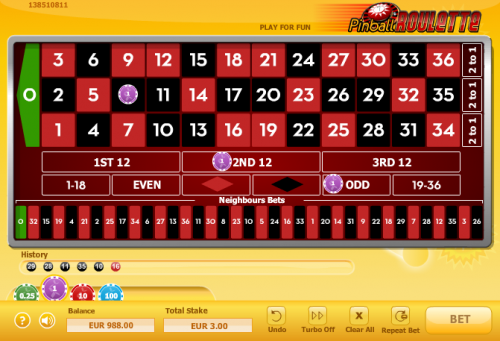 Now you can determine whether you’ve won or lost and by how much! If you’ve achieved the desired outcome and won some money you will be given the opportunity to gamble that amount by playing another pinball machine. 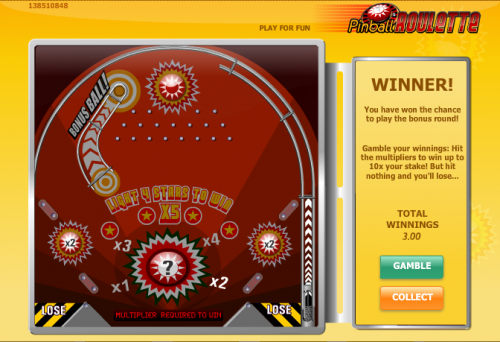 As you can see from the screenshot the machine contains a number of multipliers which can be applied to your win but the ball must strike and multiplier bumper and then drop down the middle section to win. If the ball drops without hitting a multiplier or falls into the ‘lose’ channels on the left/right then you lose. While some arcade-style slots tend to be a bit pedestrian and uninventive in their gameplay, Pinball Roulette is an interesting idea which plays well. Even the ‘gamble’ feature is not just the standard red/black choice but a whole new game. It’s well worth a go.